Max has a home! 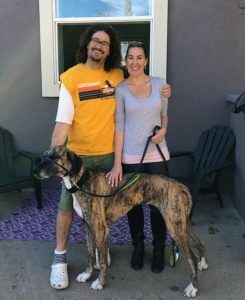 - Rocky Mountain Great Dane Rescue, Inc.
Max has a home with his foster family in Denver, CO! Max will be the only dog for Kelly & Jason, and they are already “three peas in a pod”, as Kelly says. Max loves to go for walks, and it just so happens that Jason is a professional dog walker, so a perfect match! Jason can also be home with Max during the day to give him lots of attention and love. On the weekends, they plan to take Max wherever they go. Kelly and Jason are so thrilled to have brought Max into their home, and we are so happy for Max and his new family! !